You may not have known that wine can be vegan, after all, it’s made from grapes isn’t it? But animal ingredients such as egg whites, shellfish, milk proteins and fish scales are used in ‘fining’ wine, ensuring the wine isn’t cloudy. However, plant-based techniques such as bentonite clay, silica gel or plant casein, have replaced animal based products as fining agents. The vegan trend isn’t going away. 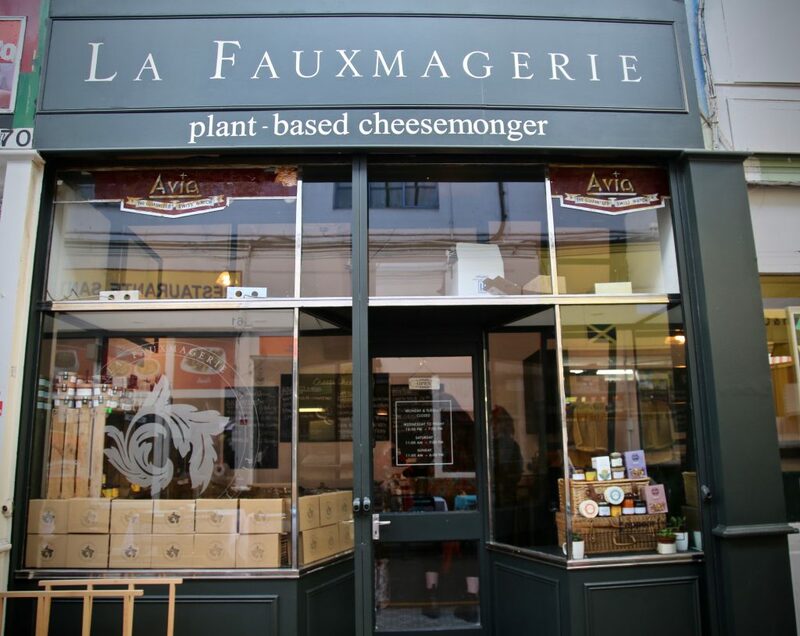 Vegan cheese shop‘La Fauxmagerie‘ recently opened in Brixton, London. They stock vegan cheeses from around the UK. On my midweek visit, there was a constant stream of visitors, at weekends, there are lines. Cheese, its vegan variant, is known under several euphemisms such as ‘sheese’, ‘chease’, ‘cheeze’ ‘tofu butter’ or even ‘Gary’. There have even been legal moves by the dairy industry to prevent vegan cheese using the same nomenclature as dairy ‘cheese’. Nevertheless for simplicitys sake, I will continue to use the word cheese throughout this article. Vegan cheeses tend to come in three main styles; made from either tofu, coconut or nuts. Some of them are very good and improving all the time. You couldn’t honestly say, hand on heart, they taste like dairy cheese, rather, they are a tasty alternative. 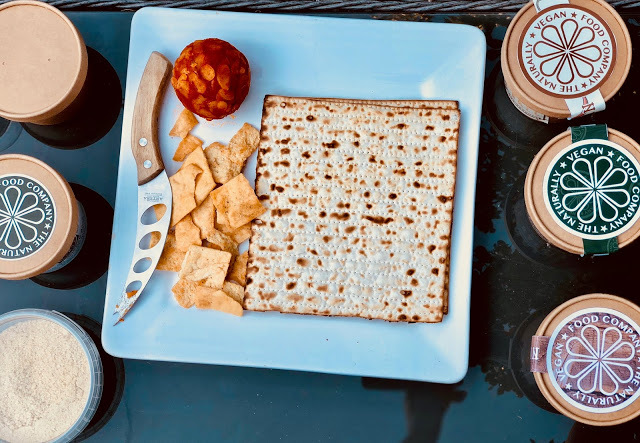 I served a vegan cheese board for Michael Gove and his wife Sarah Vine at a recent supper club I created at their house. Mr Gove, an enthusiastic foodie who is currently Secretary of State for Environment, Food and Rural Affairs, pronounced it ‘not bad at all’. Vegan cheese is obviously a good choice for lactose-intolerant people as well as those who avoid animal products. I’ve previously written about creating the perfect cheeseboard, and the same technique can be applied to vegan cheese boards. Add dried or fresh fruit, nuts, interesting crackers or biscuits, quince jelly or chutneys. Choose different shapes and flavours of cheese to create variety. And of course match them with vegan wines from winetrust100.co.uk. 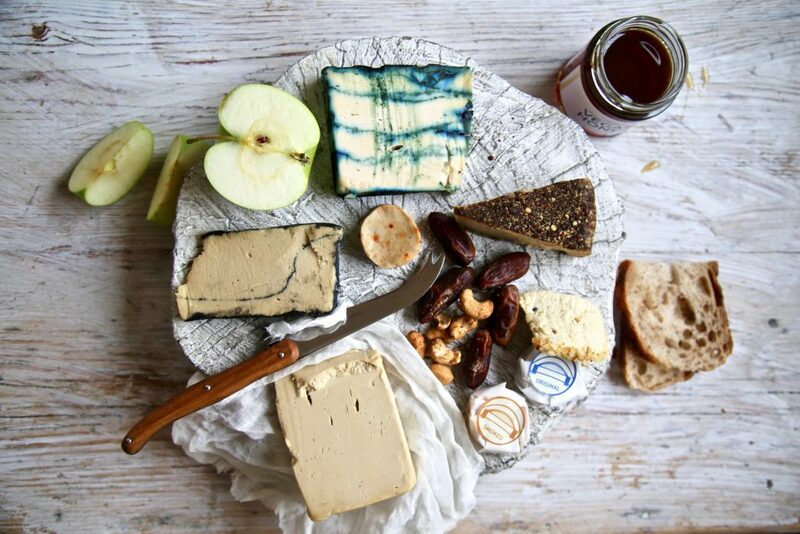 Some vegan cheeses that I’ve enjoyed include the smoked cheese ball and the cashew nut spread from the Naturally Vegan Company. The truffle macadamia round from Tyne Chease is very fresh, rich and perfumed while their smoked ‘chease’ with paprika, approximates a Bavarian-style smoked cheese. Greek company Violife offers a vegan cheddar, which has that waxy mouthfeel of real cheddar, a melty/stretchy mozzarella, a vegan fetaand even a ‘blu’ cheese. Visiting La Fauxmagerie, I discovered some artisanal small businesses, such as Kindaco, Black Arts Vegan and Iamnutok. These companies are making very unusual cheeses, with seaweed ‘veins’, black pepper crusts, cheeses with spirulina blue cheese and another which was beetroot marbled. The UK is streaks ahead of the rest of the world in creating innovative vegan products. Below I give you a very easy vegan parmesan recipe which, although you can buy it, is a snap to make at home. For this you will need the vegan all-purpose ‘nutritional yeast’ powder, which is a bit like the Brewers Yeast of the 1970s and has an umami cheesy kick. Sprinkle it over everything: pasta, salads, soups, stews. What vegan wines to drink with this animal friendly cheeseboard? As with a normal cheese board, you start with the lightest cheese, moving onto the strongest flavours. Light, crisp, Italian white. £7.50p. I’d pair this with the vegan equivalent of Boursin with black pepper –Iamnutoksell a genuinely tasty version. This South African white wine is quite a bargain, £7.25, for the quality. It’s non-oaky, fruity and aromatic. I suggest Tyne Chease, an artisanal cheesemaker from the North East of England, which makes an intriguing cashew and truffle cheese match. Stone fruit, flinty acidity and minerality, this Northern Italian white wine, £16, goes well with goat’s cheese or feta. Amazingly there is vegan feta: Violife makes a ‘Greek white block’which could be used in a Greek salad. A lovely lunchtime drink in summer. A vegan rosé from the Pays D’Oc in the south of France, matched with a French style goat’s cheese salad. I’ve yet to try this cheese, but Urban Cheesecraft sell a vegan paleo dairy-free goat’s cheese. Make a green salad, add walnuts and melt a little goat’s cheese on top with a mustardy vinaigrette. Valpolicella Superiore Ripasso Marcellise, 2015. A classic Valpolicella for £15.50. This deep full bodied black fruity wine could stand up to some of the smoked cheeses available in the vegan range such as Naturally Vegan cheeze balls. They could be eaten with crackers and dried fruit or in melty slices in a veggie burger. A Spanish red, smooth and blackcurranty, with a creatively surreal label. Match with a salad of slices of sweet sour orange, olive oil, salt and pepper, plus griddled vegan halloumi known as ‘vegeloumi’. A Spanish Rioja, 2014, £11.95, aged in French and American oak barrels, is right up my street in terms of wine. A vegan cheeseboard with cheddar, nuts and dried fruits to finish, after a long boozy plant-based meal would be my suggestion. To the new world and Chile, for a cool climate red. Match with an almond encrusted tofu based cheesecharmingly named ‘cupid’, from Black Arts Vegan, based in London. Using a powerful food blender or food processor, grind the ingredients to a coarse, crumbly powder. Add to pasta, potatoes, polenta etc. The vegan cheese and wine scene is thriving! Do you dare try them? You may be pleasantly surprised.